New Smyrna Beach is one of our favorite beach towns in all of Florida. With abundant natural beauty and controlled development, New Smyrna Beach has everything you need for a great time. If you are looking for an oceanfront condo, Smyrna Beach Club is an excellent option for your New Smyrna Beach getaway. Smyrna Beach Club offers direct oceanfront condominiums located on the barrier island of New Smyrna Beach. 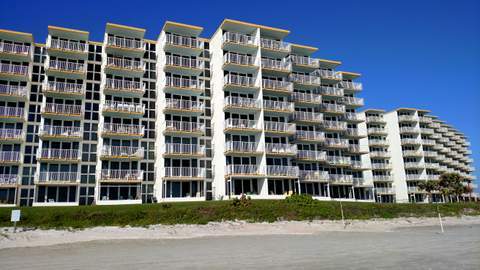 Each of their one, two or three bedroom condos front the beach. The views from the balconies are magnificent. Amenities include linens, cooking equipment, flatware, internet access, microwave oven, family size refrigerator with ice maker, dishes, color-cable TV, central heat, air conditioning, telephone, and oceanfront balcony. The common areas include a large, oceanfront swimming pool, two tennis courts, shuffleboard courts, a horse shoe pit, clubhouse, and laundry facilities. Do you enjoy the beach? New Smyrna Beach has "10 miles of unspoiled white sandy beaches stretch from the Ponce De Leon Inlet to the north, to the Canaveral National Seashore Park to the south." Do you like to golf? Hidden Lakes Golf Club and New Smyrna Beach Municipal Golf Course are both just ten minutes away. For Naturist and Nudist travelers, Smyrna beach Club is just minutes from the Canaveral National Seashore and Apollo Beach - one of Florida's legal clothing-optional beaches. We asked Julius Bruggerman, President of Smyrna Beach Club, about the property. How would you describe the unique feel / vibe of Smyrna Beach Club? Smyrna Beach Club (SBC) has more of a residential property “vibe” than a predominantly rental type property. This becomes apparent when one experiences the camaraderie among owners and guests who are treated like owners. The guests, in turn, continue to be repeat visitors and treat the units and common property as if it were their own. You do not offer short term or overnight rentals. What rental duration options are available? Describe the average guest at Smyrna Beach Club. Is the property family friendly? Senior friendly? LGBT friendly? SBC is definitely “senior” friendly in snow bird season and family oriented in the summer. SBC does not discriminate. SBC owners and guests tell us that New Smyrna Beach has the quaint charm of a small “artsy” beach town that has yet to be truly discovered. Smyrna Beach Club is located at 5205 S. Atlantic Avenue, New Smyrna Beach, FL 32169.